While Avengers: Infinity War and Black Panther have been dominating the box office headlines this year, Paramount's low-budget hit A Quiet Place 2 has still managed to impress, with $160.5 million domestic and $256.1 million worldwide, from just a $17 million budget. During Paramount's CinemaCon presentation earlier this month, the studio confirmed that a sequel is in the works, and now star-director John Krasinski has opened up about what he'd like to see in a sequel. While the director has not yet confirmed that he will return to direct A Quiet Place 2, here's what he had to say about what he'd like to see. If you haven't seen A Quiet Place yet, there will be SPOILERS below, so read on at your own risk. "The thing that I loved in the movie, where my mind kept wandering as we were making it, was the question of who was on the other end of those fires, when the father lights the fire and in the distance those other fires light up. How did those people survive? How did that old man survive? In the extreme these characters are going through, there's no room to think about that. They're there, there's an old man who's about to scream, they just have to deal with that. I think it would be interesting to see what's going on elsewhere at this same time." The movie is set in a wooded area where the Abbott family, Lee (John Krasinski), Evelyn (Emily Blunt), Regan (Millicent Simmonds), Marcus (Noah Jupe) and Beau (Cade Woodward) live in silence, after alien creatures that are blind but hunt by sound, invade the Earth. With the exception of one other man in the woods (Leon Russom), the Abbott family are the only humans we see, but there are scenes when we learn there are other survivors out there. When nightfall comes, Lee lights a fire, as we see a number of other fires being lit shortly thereafter in the distance, indicating that there are other survivors out there. When asked about the sequel potential, Krasinski said he was surprised by the reaction, since the story was designed as a one-off. "It's only a short while since the movie came out, but already people are saying, 'We want to live in this world more,' which is really interesting. I'm surprised people aren't like, 'Nah, we know what this is, and we just want to leave it as it is.' To be perfectly honest, it was never really on my mind while we were making it. I never really thought of it as an expanded world; I always thought of it as a one-off." 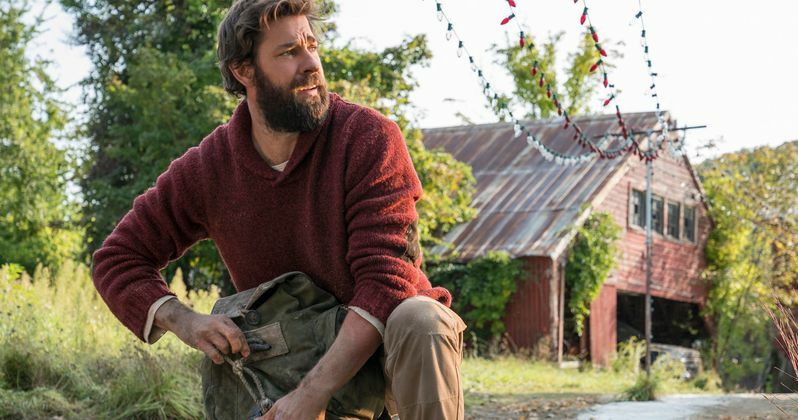 While Paramount has announced the sequel is moving forward, they have not confirmed if Krasinski will be back to star or direct, or if original writers Bryan Woods and Scott Beck will return to write the script. Michael Bay and his Platinum Dunes partners Andrew Form and Brad Fuller produced A Quiet Place, and it seems likely they may return as well, although Paramount has not indicated when production may start yet, or when this may be released. John Krasinski revealed these new details in an interview with Deadline.